Incarvillea has exotic large trumpet shaped flowers in April to June, in rich colours of magenta to rose pink, with a yellow throat. The flowers sit above clumps dark green glossy leaves growing 50-60cm high. 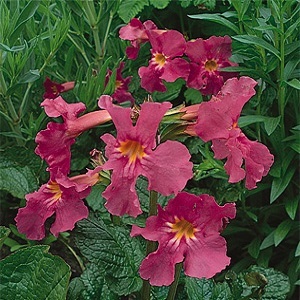 Incarvillea looks good in containers and towards the front of a border. It prefers a sunny or part sunny (morning sun) site and rich well drained soil. Pack of 30 seeds. Sow in spring or autumn. Autumn sowings need to be kept in a cold frame or greenhouse over winter. Easy to grow. Sowing instructions and a colour photo are printed on the packet. Conditions Sun to part shade and rich well drained soil. Sow in spring or autumn. Sow in a tray of moist seed compost. Press the seeds lightly into the compost, and do not cover as light is needed for germination. Keep at 16-18°C and seedlings emerge in 2-3 weeks. Pot on and grow until the plants are ready to plant out after the last frost. Protect autumn sowings over winter in a cold frame or greenhouse. Grow In spring, the flowers appear first, followed by the leaves. You may wish to mark the location of plants so as not to damage emerging flowers. Deadhead to prolong flowering. Can be grown in pots. Mature tubers can be divided in autumn.